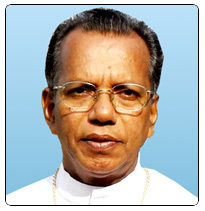 He was born on 23-6-1946 and belongs to the parish of Nadavayal in the eparchy of the Mananthavady. He was ordained priest on 20-12-1971 and has served the eparchy as assistant parish priest, parish priest, director of catechism and Mission League, eparchial finance officer, syncellus, eparchial administrator sede vacante, and later as protosyncellus of Bishop Jose Porunnedom (present bishop of Mananthavady). Since 2006 he was serving the eparchy of Bhadravathi as its Protosyncellus until his appointment as the Bishop of Mandya. He holds a licentiate in Catechetics. He was ordained bishop on 7th April 2010 and Archbishop on 30 October 2014.